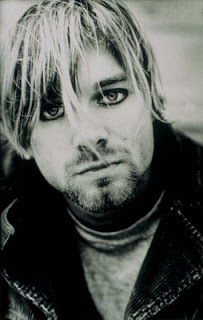 In an interview with the Advocate in 1992, Kurt Cobain discussed his band, gay activism, "carrying on with a Bisexual lifestyle" and his self-identification of being "Gay in spirit." AD: Because people thought you were gay and you had gay friends, did you ever wonder if you might be gay? KC: Yeah, absolutely. See I’ve always wanted male friends that I could be real intimate with and talk about important things with and be as affectionate with that person as I would be with a girl. Throughout my life, I’ve always been really close with girls and made friends with girls. And I’ve always been a really sickly, feminine person anyhow, so I thought I was gay for a while because I didn’t find any of the girls in my high school attractive at all. They had really awful haircuts and fucked-up attitudes. So I thought I would try to be gay for a while, but I’m just more sexually attracted to women. But I’m really glad that I found a few gay friends, because it toally saved me from becoming a monk or something. I mean, I’m definitely gay in spirit, and I probably could be bisexual. But I’m married, and I’m more attracted to Courtney than I ever have been toward a person, so there’s no point in trying to sow my oats at this point. [Laughs] If I wouldn’t have found Courtney, I probably would have carried on with a bisexual lifestyle. But I just find her totally attractive in all ways.